If you love pesto, you will adore this. 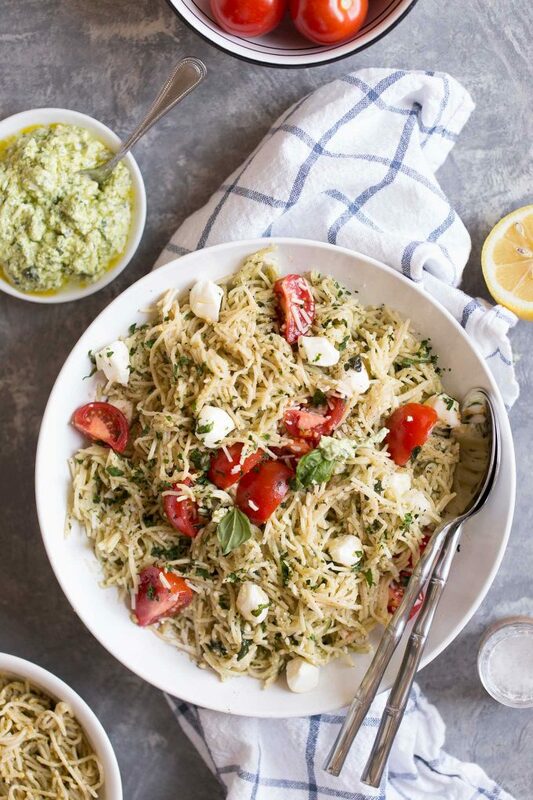 It’s whole wheat spaghetti with grape tomatoes and fresh mozzarella tossed in a lightened up creamy pesto sauce! Sponsored by Muuna. Early on in our relationship, Daniel claimed to hate pesto. It was a rough time. We couldn’t split a pesto pizza. We couldn’t go halfsies on a pesto-laden pasta. I barely made pesto for years because of it. Then, a year and a half ago when I moved into his apartment, I opened one of his kitchen cabinet’s only to find 3 jars of store-bought pesto. He had finally fallen for the green stuff—and had been making chicken salad for lunch with jarred pesto and hot chili sauce every.single.day. for months and months. You can practically feel the betrayal can’t you? I’ll tell you this: we’ve done a lot of healing since then and we can now both happily say we live in a pesto-filled home. That’s one of many reasons why this caprese spaghetti with creamy pesto sauce recipe is such a hit in our house. Other reasons: it’s super flavorful, with tons of fresh basil, garlic, and Parmesan cheese, and it’s nice and creamy—only it’s made without any cream whatsoever. The key to creaminess without the cream is using cottage cheese. 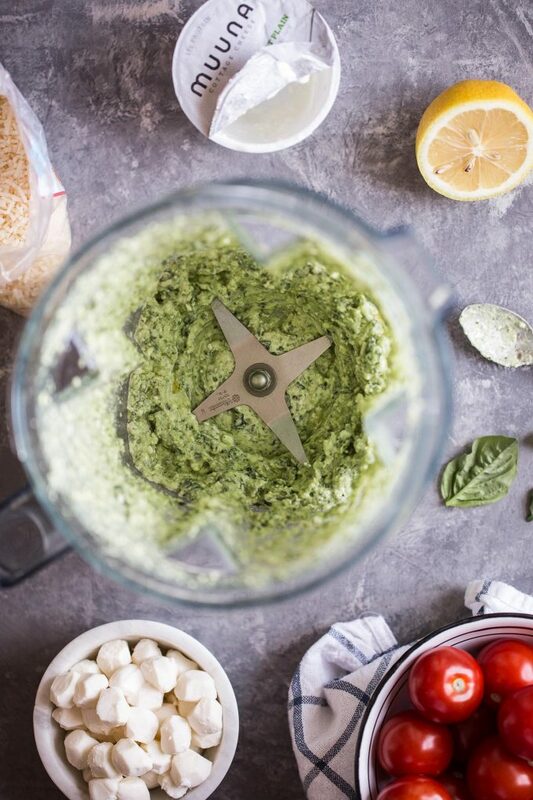 Here’s how: In a food processor, blend up a container of Muuna low-fat cottage cheese until smooth, then add all of your homemade pesto ingredients: 1 cup of loosely packed fresh basil leaves, a clove of garlic, a quarter cup each of Parmesan and olive oil, and the juice of half a lemon. Pulse pulse pulse until you’ve got a rich and silky pesto. The benefits of mixing cottage cheese into your basil pesto are two-fold. One, it’s a healthier way to create a deliciously creamy texture without adding calories—let’s face it, pesto is already pretty rich in calories as it is. And two, cottage cheese adds a significant boost of protein. 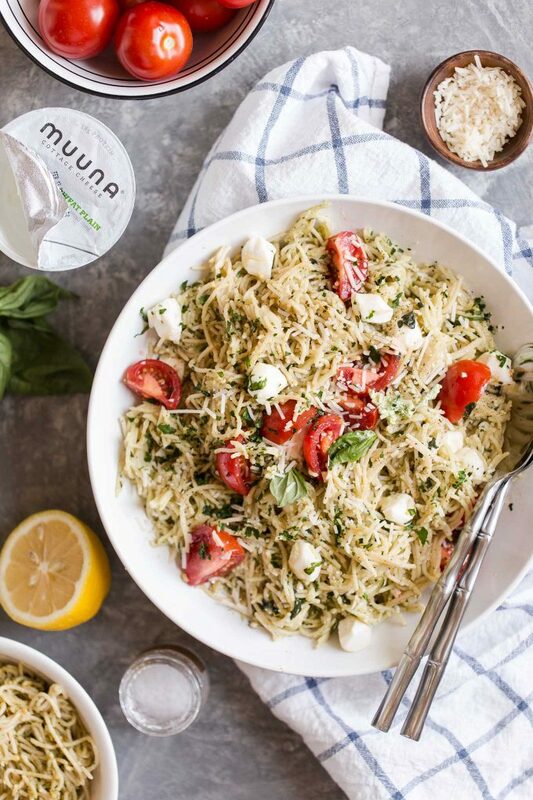 One container of Muuna low-fat cottage cheese provides 19 grams of protein, giving this spaghetti more staying power. Win-win. Muuna Cottage Cheese has introduced a line of single-serve cottage cheese cups. They’re fantastic high protein snack choices that make it easy to grab and go, and they’re also great for recipes like this! If you want to veer away from plain, there are 5 other flavors to try with real fruit on the bottom (no artificial flavors): pineapple, blueberry, strawberry, mango and peach. Bring a large pot of to a boil and cook the spaghetti until al dente. Drain. Meanwhile, place the cottage cheese in a food processor or blender. Blend, scraping down the sides a few times, to break down the chunks (it won’t be entirely smooth; don’t worry). Add the basil, pine nuts, Parmesan cheese, garlic, olive oil, and lemon juice. Blend until smooth, scraping down the sides as needed to mix the ingredients. Add salt and pepper to taste. In a large serving bowl, toss the cooked spaghetti with the creamy pesto sauce. Add the grape tomatoes and mozzarella pearls and toss to combine. Serve warm (immediately), or at room temperature. I love cottage cheese in lasagna – I’ll have to try this! This looks DELICIOUS! I wonder if it would work with zucchini noodles? I used to steer away from things with 40+ carbs a serving until I realized, opps, that is my Grape Nuts…. This reads wonderful. Fresh mozzarella is a bit of a trigger food for me, but mixed in, not so much. My wife is just making one of Your recipes, thanks for sharing and posting all the time. Wow! This looks yummy. I must try it.